I’m calling another audible. I had something in mine for this week, but I will be able to get back to that at a reasonable time. This is an addendum to another post I made about this decorating party, which can be found right here. And even with all the sentiment and heartwarming situations, there is room for laughs. We all need some comedy and laughter in our life. If not, then what’s this all for. And is there a more necessary time than during the holidays? This post might end up being funny, or just a bit dopey depending on where this goes. The title of this post might be misleading, but the label for the Happy Holidays Sparkling Wine is art. What else needs to be said. There is such care and precision put into this design, how can you not be drawn to it? For folks who love the entire wine experience, presentation is almost as important as the wine itself. First impressions don’t necessarily tell you the whole story, or even offer up some semblance of what’s really going on. We’re only scratching the surface. After the euphoria wore off, I read that this was an Italian Sparkling Wine, which would go perfect for the brunch or light appetizer part of the party I was headed to. This looked too good to open and too good to be true. I wanted this to remain a mystery. I wanted to romanticize all the beauty inside without ever uncorking. But that wasn’t going to happen. The mimosas and various champagne drinks were being guzzled at rapid-fire rates that it was only a matter of time before my bottle would be unveiled to the world, or an audience of 10. Either way this wasn’t good. After the dramatic build-up I really wanted to like it. But not even close. And the host of the decorating party was the first to lash out. My feeling weren’t hurt. They all can’t be winners. It tasted nothing like champagne, sparkling wine, or some other facsimile. It was too thick and too heavy to be considered champagne or anything remotely close. Like I said, I wanted this to be one of those bottles that you’ll be talking about for years to come. That’s not even close. But the fact that it was hard to drink is what made this so funny. We had a bunch of cheap and standard-label champagne to start off, that served its purpose and went down smooth. That’s all we want in a champagne brunch. Maybe the sparkling wine would have been better served in another capacity, but I don’t see it. The hostess was great to find the positives in this. The bottle had already been open, and we waited until all the other champagne tapped out to finish this one. It just sat there looking lonely. No one wanted any. But that label can’t be disputed. I could stare at that for a while, or until I got restless and wanted a good wine or champagne. It was funny trying to avoid drinking this until absolutely necessary. It was tolerable enough to finish but a struggle at the same time. That’s not an endorsement. If I were to talk badly about a wine, I wouldn’t want it to be during the holidays, but I gave myself much higher expectations. And because of the imagery, I doomed myself with such lofty expectations. I would say I’ve learned my lesson, but I wouldn’t want to. It may be a novice thing to buy a wine based on a label but the heck with it. Buy what you want, drink what you like, and take some chances. I did and I’ll do so again. I can’t find much about this bottle online, except for this link. Not sure this can help. More on the winery itself, Villa Jolanda, can be found here. For my friends in Maryland, I found this at Wine World in Abingdon, MD. If you would like to see my friends’ party recap from last year, this is the link for YOU! I will bid farewell with a few more pictures from the decorating party. Regardless of how the wine was, everything about the event was perfection. I can only hope the next wine I bring to one of these affairs will be the same. As always, happiest of holidays to you. Christmas is only two days away and I’m sad it’s heading into the final hours. Every season has a different feel for me, and this one has been no different. Starting this blog over a year ago has allowed me to expand my palate and my wine choices. That’s one of many things I’m thankful for this holiday season. With it being Christmas week, I had to find a label or a creative bottle that fit that mold and enhanced my spirit of the holidays. I found myself at my Wine World and simply asked if there were any bottle that depicted the true spirit or just showed that cheerful jolly guy on the cover. I am thrilled to say that the Christmas Wine from Duplin Winery proudly showcases all of that. I wish I could say the same about the taste of the wine itself. It’s an acquired sip that may take a while to obtain. Muscadine is not a grape I’m familiar with. And when the staff member told me that, I thought for sure he said Moscato. I wanted to like it. I want to like everything connected with the season, but this just didn’t pan out like I had hoped. I think I have had this at a wine festival or outdoors in a proper setting, I may think differently. I’m certain many people will love it. If you’re not a wine drinker or prefer sweeter choices, this is going to work perfectly. At a small holiday gathering with pals, no one else was interested in even a quick sample. That will happen after drinking heavier reds and eating a hearty meal. My aim was for a good counterbalance after dinner with some sweet treats. We even broke out the reindeer glasses but it wasn’t enough. Sweet treats were had in the form of some ginger spice cookies, but the wine wasn’t cutting it. I wish I coud say otherwise. In perusing their site, they do have other holiday varietals that sometime I would like to give a shot. I’m all about expanding my horizons. And those labels are adorable. If you’re interested in purchasing any of their wines, you can click here. And a store locator is here. Hopefully it’s available at a provider near you. Next time I’m passing through or visiting the great state of North Carolina, I would love to visit and check out all the sights and sounds of what they have to offer. I love random visits and wine tours, and whenever I see a sign for one driving down a highway I get excited, just like a kid on Christmas morning. Speaking of Christmas, I wish all of you a beautiful one. I hope you get to spend it with the ones you care for. I will be doing so. And I look forward to enjoying some great vino and food pairing with some many of those awesome people as well. Stay healthy and take good care. I gotta admit, I purchased this bottle, only for the label itself. And nothing more. And I was pleasantly surprised. This is a fun smelling and tasting wine. But the most important question of all, how cool is that pig? 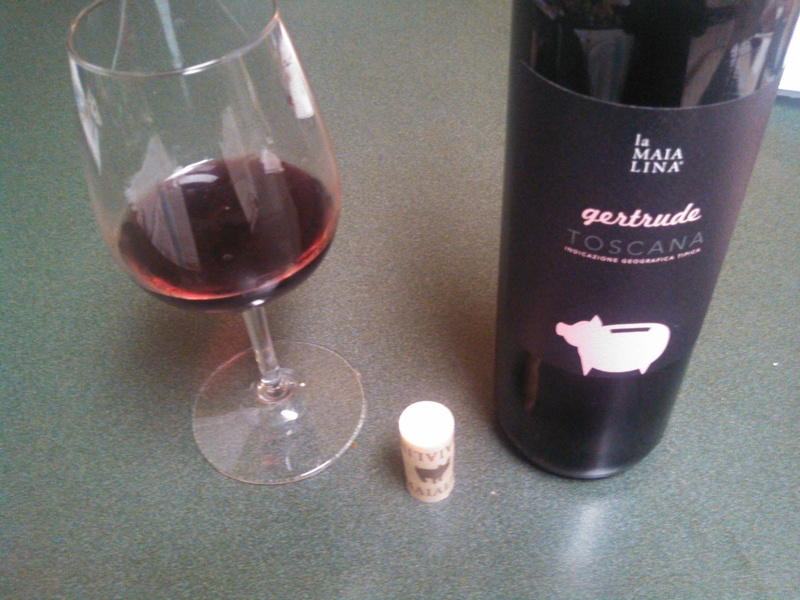 The 2012 La Maialina Gertrude from Tuscany is a steal at only $11.99. This is a wonderful trio of the Cabernet Sauvignon, Merlot, and the inspiring Sangiovese. I must make mention that this was purchased at Lighthouse Liquors in the Canton part of Baltimore. They have one heck of a selection, and I find myself going in there at least once a week. In a subsequent post, I will get into the further details and expound about the fun things of this shoppe. 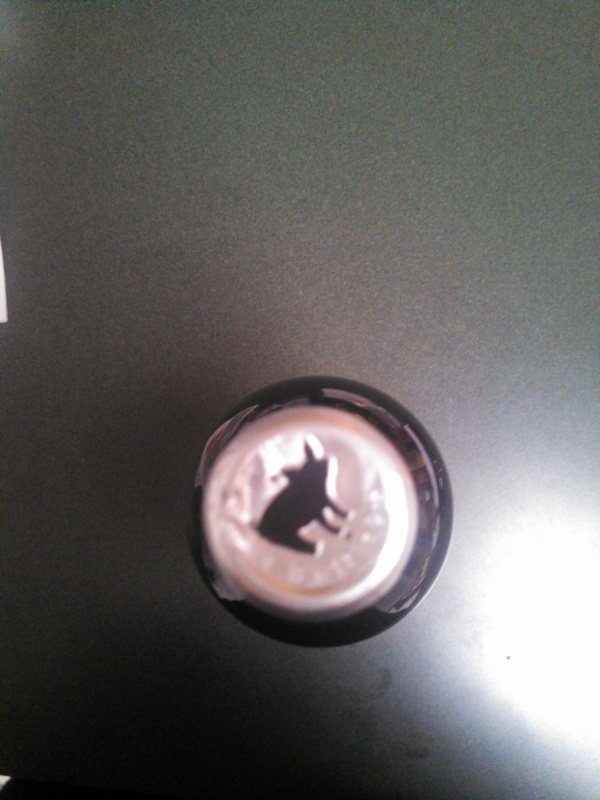 When I uncorked the bottle, I detected some cherry and mint flavors off the top. I initially thought this would be an amateur move, buying this wine because of how pretty the design was. But I was pleasantly surprised on the taste. Just as good as it smells. But this is a wine that can be enjoyed at any time of the year. And it can be eaten with anything within reason. Within reason is entirely up to us. So what about the pig? Very charming, I know. What you see is the wrapping on top of the cork, and this looked too brilliant to pop open. And see, that Gertrude cannot be stopped. You know I’ll be saving that cork, and heck, the bottle too. Not much is on the web about this wine, aside from several reviews. The origins of the La Maialina are listed on the back of the label and can also be found here. The description of the back says Gertrude is unique she does not have the cinta (belt) markings but rather is all. I’m honored to be a part of something unique. I love Gertrude. Finally, the synopsis reads that this awesome Tuscan wine is ready to be enjoyed now or in the next few years. I look forward to doing both. This is definitely a purchase I am happy about. With Italian wines, I usually enjoy them with pizza and this is no exception. I am happy to have met Gertrude and sometimes is does help judging by wine by it’s cover. But not too much.